Distribution and habitat: Asparagus setaceus is a vine plant in the genus Asparagus. It is native to Southern Africa and is grown elsewhere as an ornamental plant. It has become an invasive species in several locations where it has been introduced. This species is found in native forests and scrub areas and is also found to occur in open coastal areas. 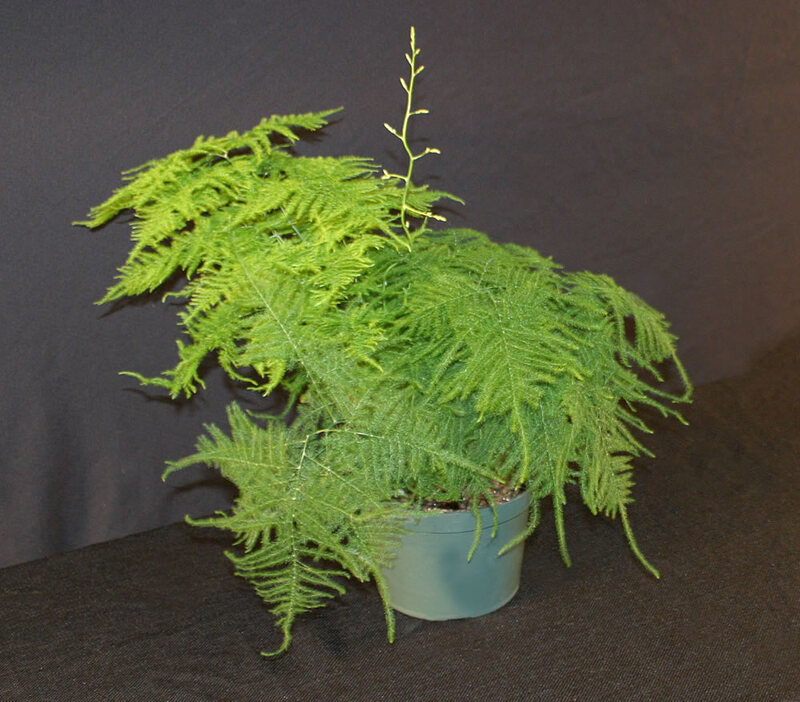 Despite its common names, this plant is not a true fern, but has leaves that resemble one. Description: Asparagus setaceus is a scrambling perennial evergreen herb with tough green stems, which may reach 1m (3 feet) in length. 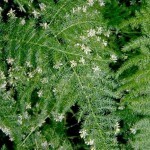 It has wiry stems with an upright habit and and a flattened spray of bright green branchelets displayed horizontal. 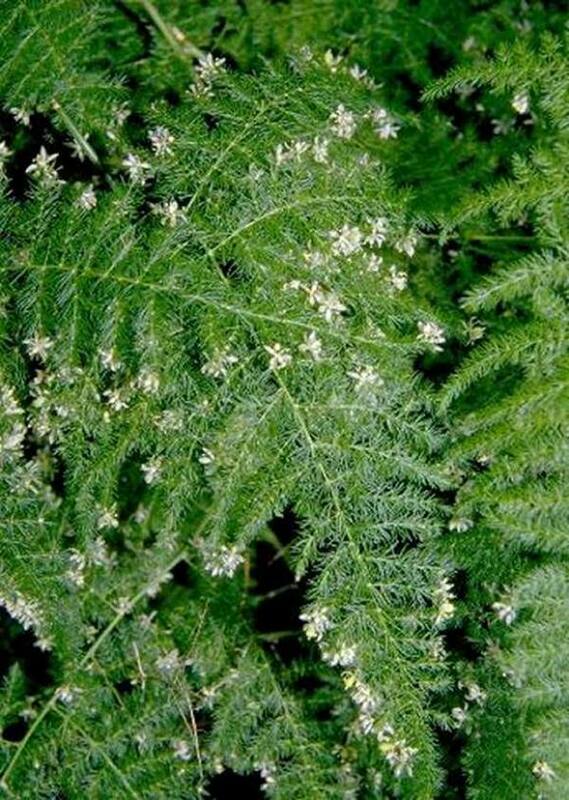 The leaves are actually tiny leaf-like cladodes, which arise in clumps of up to 15 from the stem, making a fine, soft green fern-like foliage. Occurring from spring to autumn, the small greenish-white bell-shaped flowers are followed by small green berries, which blacken with maturity. The flowers have no ornamental importance. 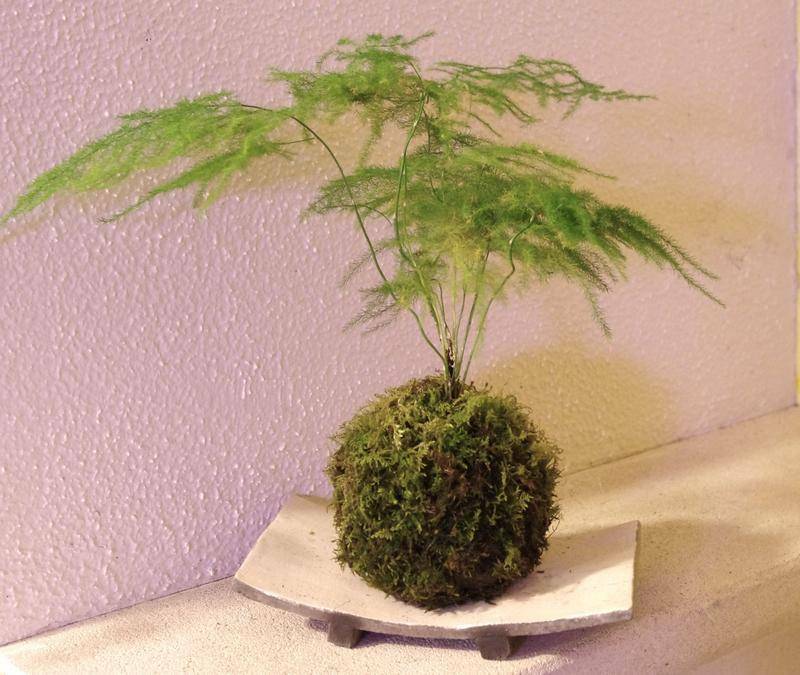 Houseplant care: Asparagus setaceus is a fast grower and are easy to grow indoors. Light: Bright light is essential for Asparagus setaceus. But never subject them to direct sunlight, which can badly scorch the small leaves. Temperature: Asparagus setaceus do well in normal warm room temperatures and they also tolerate temperatures which may be as low as 13°C (55°F). Watering: During the active growth period water plentifully as often as necessary to keep the potting mixture moist, but never allow the pot to stand in water. During the rest period give the plants only enough water to keep the potting mixture from drying out. 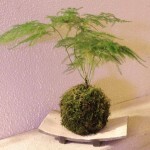 If the mixture dries out entirely at any time loss of foliage is the result. Feeding: Apply liquid fertiliser every two weeks throughout the active growing period. Potting and repotting: Use a soil based potting mixture. Move the plant every spring into pots one size larger until they are in the largest convenient pot size. After this size has been reached, top-dress annually with fresh potting mixture. Keep the level of the potting mixture well bellow the rim of the pot because the thick asparagus roots tend to force the mixture upward. Propagation: Propagation in home is usually done by dividing overcrowded clumps just as growth starts in spring. Remove any excess mixture from the tuberous roots and separate them with a sharp knife. Plants separated clumps in 8cm (3 inch) pots of soil-based potting mixture and treat them as mature specimens. Although, Asparagus setaceus can be raised from seed. Seed germinates in well warm room, but the growth is slow. Problems: Problems appear usually as result of incorrect treatment. Yellowing and falling leaves usually indicates conditions that are too hot and too dry. Overwatering the plant or allowing it to stand with the roots in water may cause root rot. Asparagus setaceus ‘Nanus’ is a dwarf form. Asparagus setaceus ‘Robustus’ is an expecially viguros form of Asparagus setaceus. These plants do not climb when young, but as they mature they begin to send out climbing stems which can be as much as 1.5m (5 feet) long. These stems are often bare at first and purple in colour, but they will eventually produce the characteristic tiny, bright green branchlets. Companion plants: Three species of Asparagus arranged together into an attractive hanging basket: trailing – Asparagus densiflorus ‘Sprengeri’, Asparagus densiflorus ‘Myers’ and upright – Asparagus setaceus. Toxicity: The fruit (berries) of Asparagus setaceus are toxic. 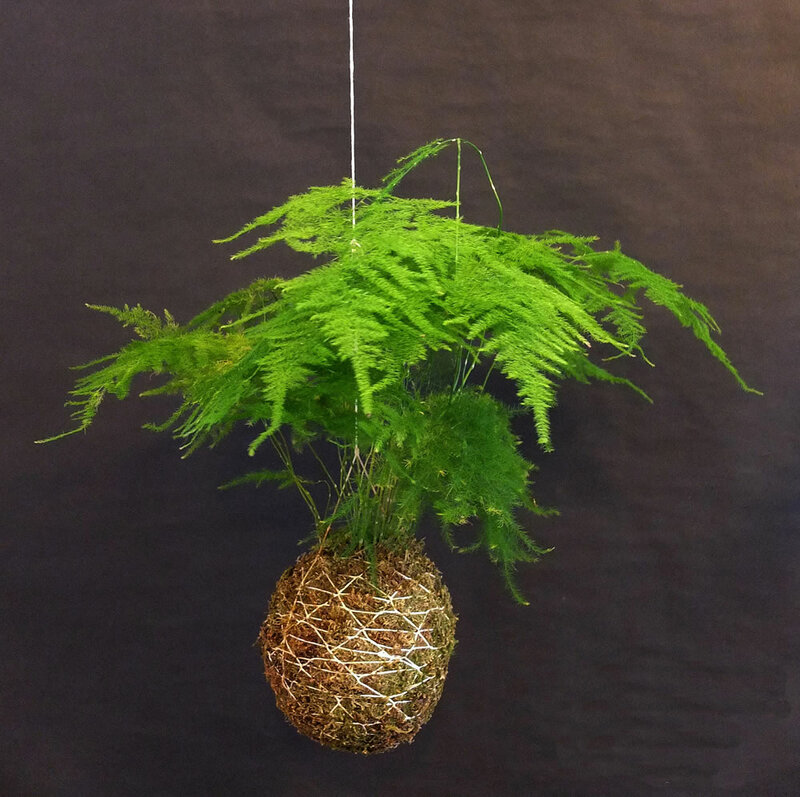 Uses: Asparagus setaceus looks lovely in porch pots and hanging baskets during the spring and summer months and makes a stunning indoor plant. 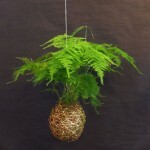 The attractive foliage is also used in floral arrangements.